I had never thought about getting a chicken wing rack. 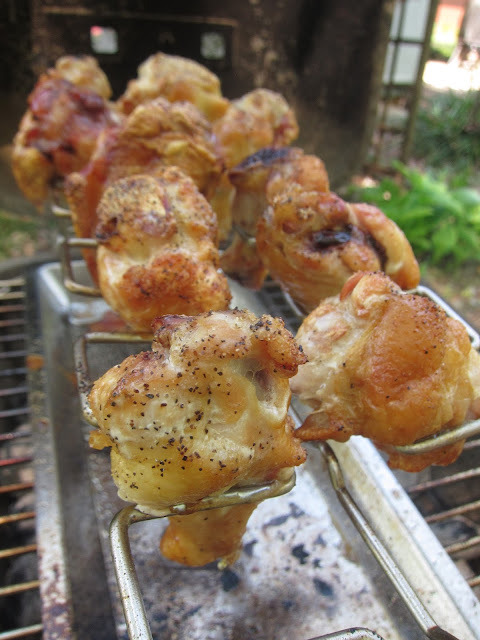 I grill some wings and the chicken drumettes, but I've also been old school, turning and turning. Cave Tools got in touch and asked if I'd test and write about a product if they sent one out. I am pretty over my rain forest fall and leg injury, so I thought I check it out. The chicken wing rack which will also work for really everything but the breasts which you might cut down and still try turned out to be quite sturdy. The rack part does fold flat, but it is solid and has a connection that holds it in place really nicely. I ran down to IGA (the only store closer than say 1/2 hour) and grabbed a bag of chicken wings. Some pieces did look like the dumette part of the wing. Other parts . . . I just don't know. The flavor was fine, and the price was good. I do like to do pretty displays. My boys don't care on the displays, so we'll coin toss that next time. I just slipped the small pieces and parts of chicken into the Cave Tools rack. The rack was rock solid. It was easy to load it up and cook on the rack. I also used a glove and tongs to turn the pan rack around a couple of times for more even cooking. When the chicken was down to about 5 to 6 minutes left to grill I sauced them up, since we wanted hot wings. You can see that sugar based sauce will burn in the pan which is normal. If you want drippings for gravy, for example, do not sauce or pour off your drippings and be ready to use them later as you finish up the saucing. Yum. Those Were Some Yummy Chicken Wings! Using the rack which will hold up to twelve pieces was really handy. I enjoyed not having to watch close and turn the small pieces of chicken. For a group, I'd suggest a couple of racks. We ate 8 of 10 here - and the other 2 for a snack. I'm not used to saving drippings, but this pan will make that super easy. Even if I don't want gravy or drippings on a grilling night, I can free and use those tasty bits and fat for later. I'm trying to do better about no waste grilling and no waste living. Wing racks were an item I was ho-hum on. I knew I could do it fine without them, but it was so much easier. 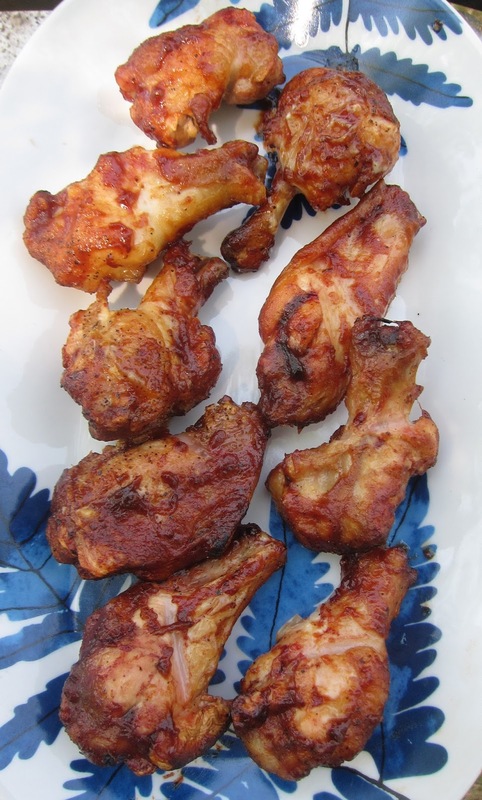 The juice dripped down through the wings, keeping them very moist. Clean up of the pan was easy, and I'm not ready to getting me some drippings. Cave Tools has a lot of nice looking tools. I can say for sure that the wing rack is well made and works great. Those were the easiest wings I've made. Add in drippings, and this one is certainly thumbs up. If you shop at Amazon, then you can pick up the chicken rack there. 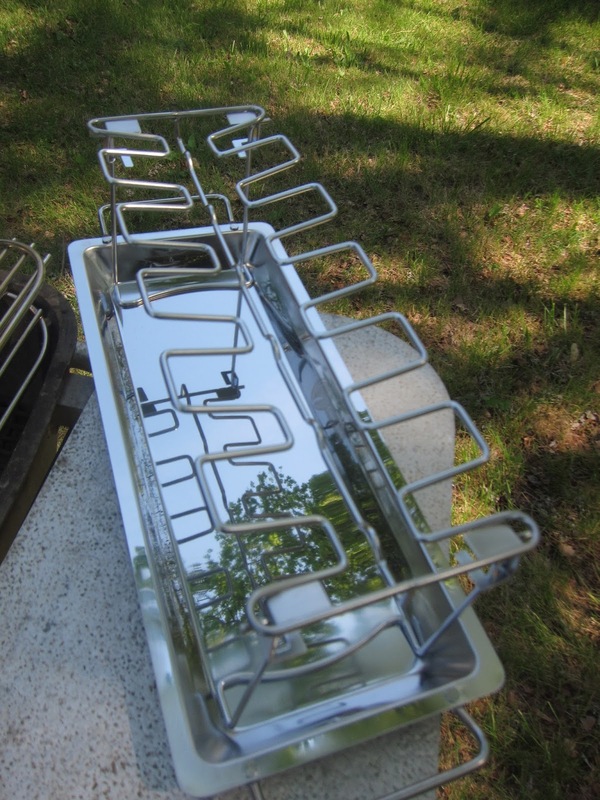 It would make a great gift for a home griller who does not own one yet. And . . . a deal for you! 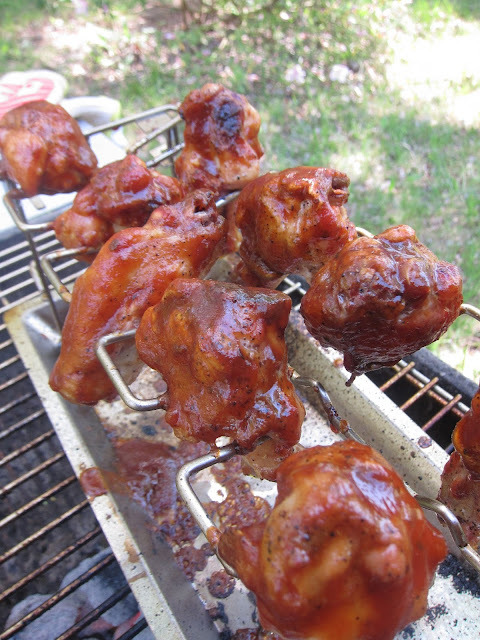 Use code WING15 for 15% off on your very own easy chicken wing rack. This is a nice wing rack, Cyndi! Holding up 12 pieces sure is handy specially when this is going to be the specialty on the table! :D Just make sure you clean the grill up properly. You can check out my blog here theparanoidparents.com and you'll realize that cleaning the grill using the right tool should also be considered for the whole household (specially for the kids).